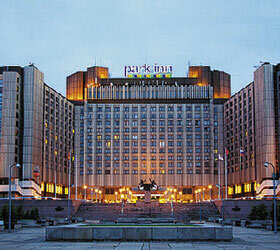 "The Park Inn by Radisson Pribaltiyskaya" is a modern and comfortable hotel ideal for business and leisure travelers. It is located on the edge of the Gulf of Finland, next to EXPOFORUM (LenExpo) Exhibition Complex, within 10 minutes' drive to such great cultural attractions as the Hermitage and Peter and Paul Fortress, and 25 km from Pulkovo-2 International Airport. The Park Inn by Radisson Pribaltiyskaya has 1184 spacious rooms, offering bay or city views, including: Standard rooms, Superior, Junior Suites and Duplex Suites. All rooms are equipped with the following high-quality amenities: individual climate-control system, dial-up Internet access, 24-hour room-service. Junior Suites consist of a bedroom and a living room, and offer stunning views of the Gulf of Finland. They come with the following extra amenities: in-room safe, hair-dryer, bathrobe and slippers, bath amenities. Duplex Suites consist of a spacious lounge, a study, a kitchen and a bathroom at the lower level, and a bedroom with a king-size bed and a bathroom at the upper level. These Suites are equipped with the following special amenities: in-room safe, hair-dryer, bathrobes, slippers and telephones in the bathroom, bath amenities, entrances on both the first and the second levels. With an impressive array of meeting and event rooms, the Park Inn by Radisson Pribaltiyskaya Hotel stands out as one of the premier conferencing facilities in the area. The hotel offers 26 meeting rooms all with natural day light, stylishly renovated with the most modern technical equipment, WiFi, and individual climate-control. The largest conference and banquet hall can accommodate up to 1,500 delegates. Guests can enjoy restaurant options offered to them in Park Inn by Radisson Pribaltiyskaya. The first RBG Bar&Grill in Russia, the hotel's restaurant features the famous Stone Grill and serves European and Russian cuisines. The Lounge Bar is opened round-the-clock and invites to enjoy coffee, snacks, live music in the evenings and sport events on large screen. The Park Inn restaurant invites all hotel guests to the light and cozy dining areas for buffet breakfast. The hotel hosts a unique "Waterville" Aqua Park with slides, pools, sauna complex, and the "Roman Holiday" Wellness and SPA Centre with 150 treatments and 15 types of massage. Other services and facilities of the Park Inn by Radisson Pribaltiyskaya St Petersburg include: laundry, dry cleaning and tailoring services, 24-hour medical services, currency exchange office, and souvenir and gift shops.